I am currently doing a mass unit of slightly less than 60 figures in one fell swoop. Or rather, one protracted, repetetive monotonous paint-everything-of-the-same-colour in a sitting. Which is in a sense quite meditative, after I get past the settling-in phase, and enter the flow of it. After metals and flesh base coat. After all, this army is made for dipping. More on dipping later. Clothing in light grey and a few reds. Here is when all the main colours have been blocked in. I do not bother with highlighting, shading or whatnot. The dipping will take care of that. After I reach this point I usually am sick to the very soul of the figures. They are all so similar! And MANY! So I break them up into groups of 5 to 10, and finish them up, details and such that are needed before dipping. 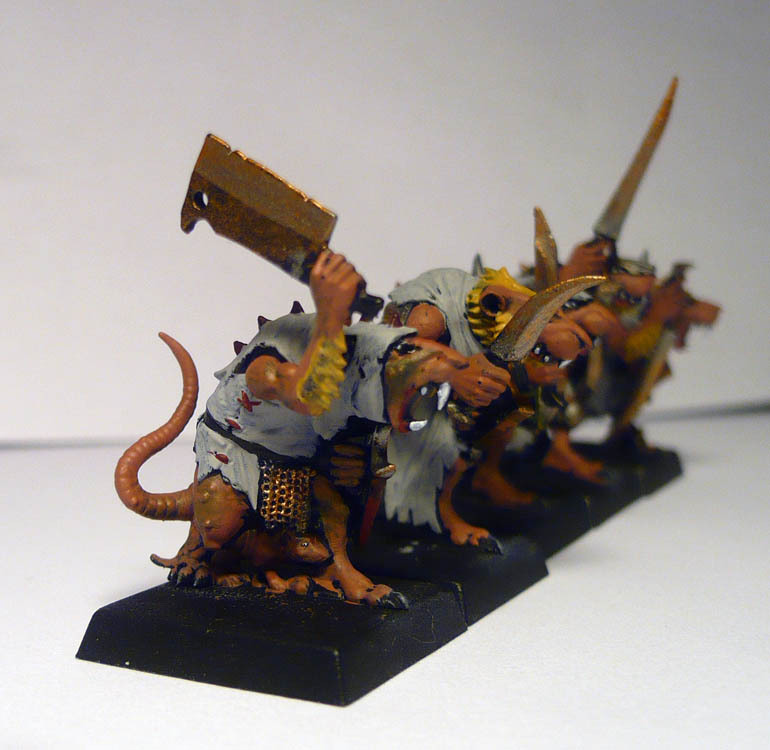 A group of 5 clanrats or slaves, ready to be dipped. The main thing anybody looks at in a miniature is the face. So I always do the face fully and do the eyes and mouth neatly. When the faces are good, the rest doesn’t matter as much, and you can be quite sloppy without it being so noticable. In the moshpit of battle rank and file on the tabletop, most details tend to blur anyway. Anyway, Skaven are filthy, scruffy creatures and the paintjob should be too.